Which state had the most Eagle Scouts in 2017? Which had the fewest? Utah is our nation’s 45th state, but when it comes to Eagle Scouts, it’s No. 1. In 2017, no state gave us more Eagle Scouts than Utah. It tops the list for at least the ninth year in a row — every year since 2009, the first year for which detailed Eagle Scout statistics were made available to me. California, Texas, Pennsylvania and New York round out the top 5. That’s the same top 5 as 2016, with one exception: New York has bumped out North Carolina. Combined, these five states account for 19,834 of 2017’s 55,494 Eagle Scouts. That’s roughly 36 percent. Keep reading for the complete rankings. Below that you’ll find the population-adjusted rankings, which even things out quite a bit. After all, it’s not fair to compare the number of Eagle Scouts in the state with the fewest young men under 18 (Vermont) to the state with the most (California). Here are the 2017 state-by-state rankings, as well as the rank change from 2016 to 2017. Example: The +2 for New York means that state’s rank jumped up two spots: from No. 7 in 2016 to No. 5 in 2017. I used the data available here to find the number of under-18 boys in each state, as of 2016 (the most recent year available). That allowed me to create the following population-adjusted list. Notice that Utah remains No. 1, but less-populous states like Idaho, Rhode Island and Wyoming jumped into the top 10. Higher-population states like Texas and California are in the bottom half of this list. What about Eagle Scouts who don’t live in one of the 50 states? Not all Eagle Scouts live in one of the 50 states. Here’s the breakdown of Eagle Scouts living elsewhere. What are the council-by-council numbers? Some Scouters asked for this, so here it is. There are two sorted lists. The first is sorted by council number (find yours here); the second is sorted by number of Eagle Scouts. Keep this in mind: There are small councils and large councils, so this list doesn’t tell the whole story. For more Eagle Scout stats, click here. Hat tip: Thanks to the BSA’s Mike Lo Vecchio for the data. 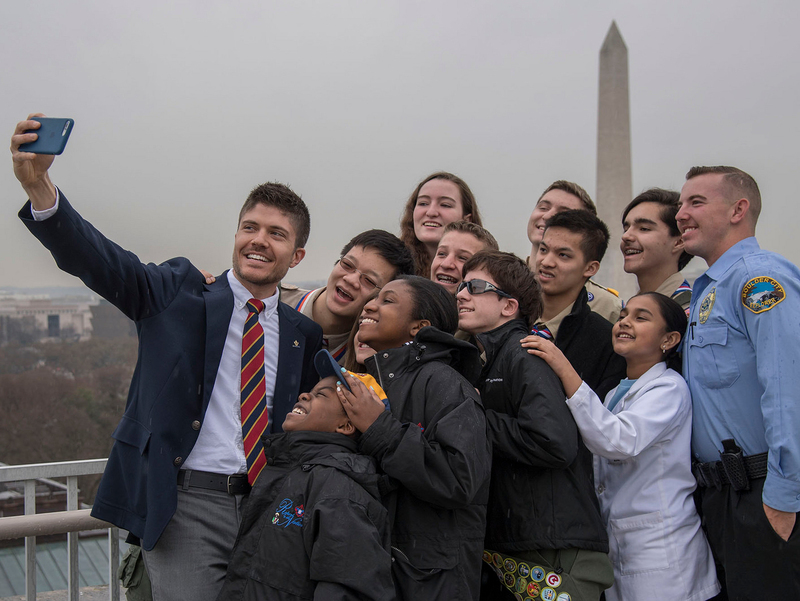 Nine quotes about Scouting from the Eagles on the Hill gathering in D.C.